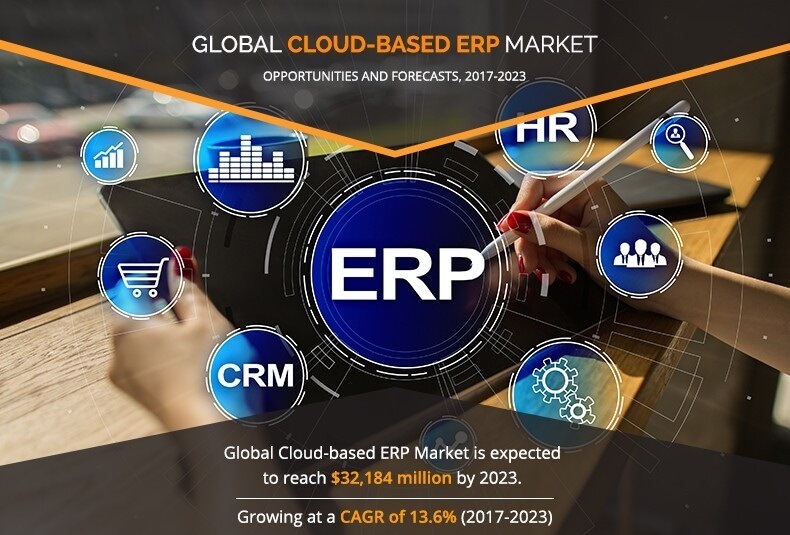 The global cloud-based ERP market was valued at $13,238 million in 2016, and is expected to reach $32,184 million by 2023, growing at a CAGR of 13.6% from 2017 to 2023. Enterprise resource planning is a business application, which is useful for enterprises to integrate their business functionalities to achieve high efficiency and productivity. Cloud-based deployment platform has given a significant boost to the enterprise application software during the last few years. Furthermore, it focuses on adoption of cloud-based ERP in various industry verticals such as manufacturing, healthcare, retail, government, BFSI, telecom, and others. The North American cloud enterprise resource planning market generated the highest revenue in 2016, owing to increase in adoption of cloud-based solutions, presence of a large number of enterprises, and rise in the adoption of IoT. 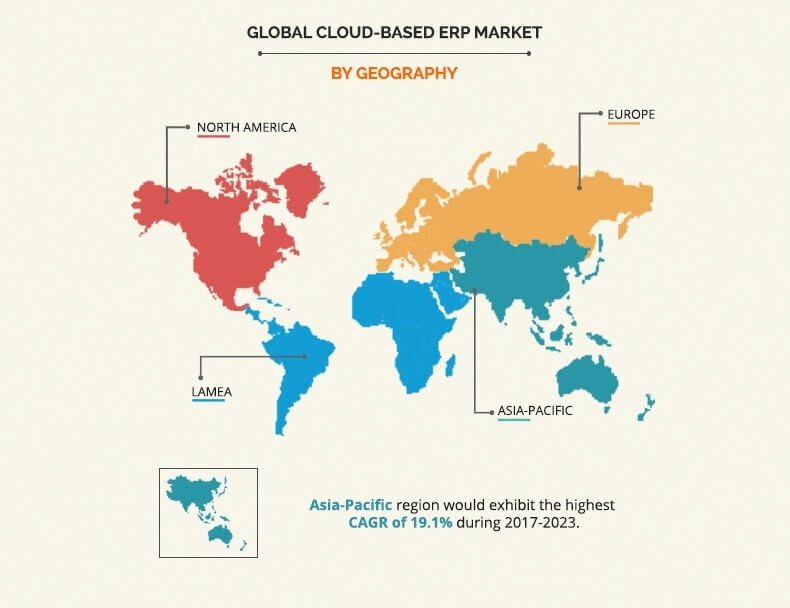 The Asia-Pacific cloud-based ERP market is expected to grow at the highest CAGR, owing to increase in penetration of internet and surge in adoption of ERP application in the government agencies. Furthermore, SMEs in the region require technologically advanced solutions to manage departments & functions, which fosters the adoption of the cloud-based enterprise applications. The key players operating in the cloud enterprise resource planning industry include Oracle, IBM, Microsoft, SAP, Sage Group Plc, QAD Inc., IFS AB, Epicor Software Corp., Infor, and Aptean. These players have expanded their market presence by adopting various business strategies such as acquisition, geographical expansion, product development, strategic alliance, and collaboration. 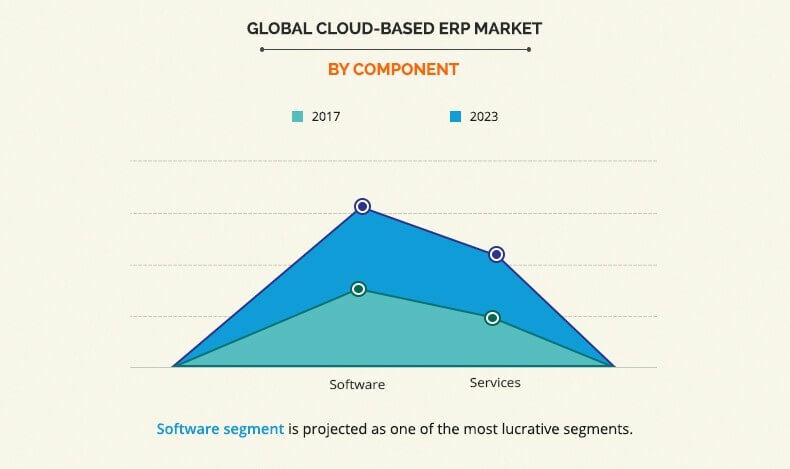 The following graph signifies the growth potential of the global cloud-based ERP market by solution. It is observed that the others segment (includes human resource management, environmental resources management, management information system, decision support system, Business continuity planning, collaboration, IT service management, enterprise application integration, and enterprise forms automation), which occupied the largest market share in 2016, drives the market. However, major growth is observed in the content management system (CMS) sector where cloud-based ERP solutions are expected to witness considerable adoption in the near future. Large number of companies operating in the global cloud enterprise resource planning market offer specific enterprise resource planning solutions as per the requirements of the end-user industries. Selection of enterprise application depends upon factors such as need of enterprise, business size, functional areas, and expected benefits to organizations. Major enterprise resource planning solution available in the market are NetSuit ERP, EcountERP, Brightpearl, and Intacct. Companies increasingly invest in the IT sector to implement enterprise application for proper work. Adoption of enterprise application leads to enhanced business performance. However, adoption of cloud enterprise resource planning depends on business requirement, as it reduces operational costs and helps the organization to perform multiple tasks at a time. Cloud-based enterprise resource has witnessed high adoption in North America, owing to established high data processing enterprises in the country such as the U.S. In addition, to leverage the businesses and to enhance the customer experience, enterprises have adopted enterprise resource planning, which fuels the market growth. In-depth analysis of the global cloud-based ERP market and dynamics is provided to understand the market scenario. A detailed analysis of the geographical segments enables identification of profitable segments for market players in the cloud-based ERP industry. 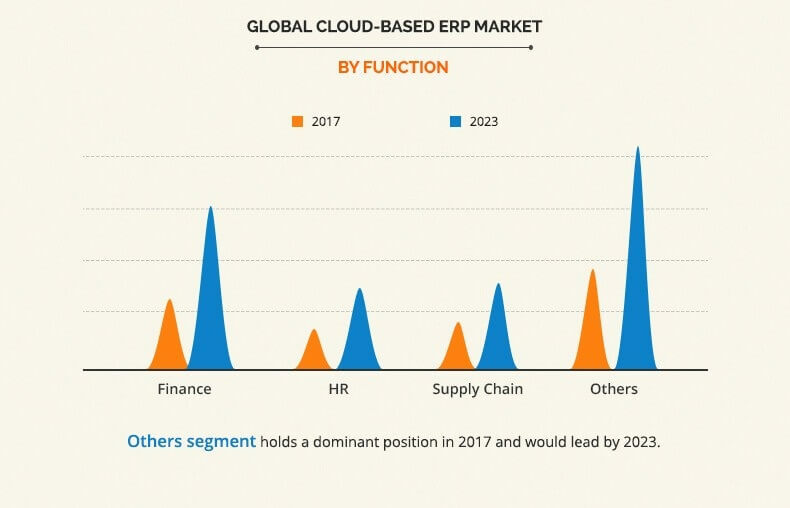 Detailed analyses of the key players operating in the cloud-based ERP industry and their business strategies are anticipated to assist stakeholders to take informed business decisions.